For use with non-rebreathing circuits. Adds extra safety to a non-rebreathing circuit by incorporating an adjustable pop-off valve and a breathing circuit manometer. Pressure variations can occur in non-rebreathing circuits connected to piston type ventilators. When properly mounted in a non-rebreathing circuit, with a resevoir bag attached, this device assures adequate flows to piston type ventilators. 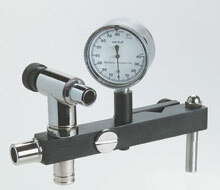 Accepts all single tube breathing circuits such as Magill, Mapleson, Jackson-Reese, and Bain. Includes adjustable pressure limited pop-off valve, -40 to +80 cmH20 respiratory pressure manometer swivel-mounted, coaxial 22mm male x 15mm female circuit mount, 19mm male gas evacuation port.